There are plenty of “travel” mice on the market—compact models designed for carrying in your laptop bag. But most are simply standard mice in smaller packages. The folks at Kensington evidently decided that wasn’t good enough, as the mice in the company’s new SlimBlade series offer interesting features that go beyond point-and-click. Here's a look at two SlimBlade models I've had the chance to test recently. Weighing just over four ounces with batteries, the Bluetooth SlimBlade Trackball Mouse ($100) is, as its name implies, quite slim—about one inch thick. Overall, the mouse is fairly comfortable, with a smooth, rounded shape that’s raised slightly in the rear (under your palm); a rubber strip provides added grip on the sides. The two standard mouse buttons—left and right—are actually part of the shell. If that description makes the SlimBlade Trackball sound similar to Apple’s own Mighty Mouse, that’s because in many ways it is, right down to the scroll ball in between the mouse buttons (although Kensington’s ball is larger and easier to use than Apple’s tiny sphere). But there’s one major difference between the two mice: On the SlimBlade Trackball, if you double-click the area just behind the scroll ball, the mouse’s laser is deactivated and the scroll ball turns into a trackball. This is handy for those times—trapped in a coach airline seat, for example—when you don’t want to use your laptop’s trackpad but there’s no room for sliding a mouse around, or when working on a surface that doesn’t get along with a laser sensor. The trackball works well and is easy to use, especially if you came of age during Apple’s trackball days. (It’s almost like using a PowerBook Duo again—except without the tiny, ghosty screen and the miniscule hard drive.) That said, there are a few caveats to trackball mode. The first is that you obviously lose the “middle click” functionality offered by most scroll wheels. The second is that you can’t scroll documents and windows as you normally would, since the ball is controlling the mouse cursor rather than scrolling. However, Kensington does offer a workaround: if you move the cursor to a scroll bar and click the trackball/scrollball button once (instead of twice), the trackball switches to scroll mode until you click the button again. Similarly, although it’s easy to move the cursor and use the mouse buttons separately, it’s difficult to do so simultaneously; for example, to select text, or to click-and-drag an onscreen element. The trackball/scrollball button comes to the rescue again here: click it once (outside of a scroll bar) and the mouse acts as if you're holding down the mouse button. For example, to select text you move the mouse cursor to the begging of the text, click the trackball/scrollball button, move the cursor to the end of the text to highlight it, and then click the button again to “release.” To drag an item—for example, a file or a bit of highlighted text—you position the cursor over the item, click the trackball/scrollball button, move the cursor to drag the item to the desired location, and then click the button again to release. These clever workarounds take some getting used to, but they worked well in my testing. Kensington claims a pair of AA batteries should last up to six months; I haven’t reached that point yet, but the mouse's “fuel gauge”, which is built into the shell and lights up when you turn on the mouse or connect it to your computer, still shows a full tank, so to speak. The trackball/scrollball switch also functions as a power button to preserve battery power; you hold it down for three seconds to turn the mouse off or on. As with the tiny trackballs on Apple’s early PowerBooks, I wouldn’t want to use the SlimBlade’s trackball as my primary means of mousing around; as much as I loved my old Duo, I still get phantom twinges in my hand when I recall using that little ball for a full day of work. But the trackball is an interesting alternative for occasional use—and it lets you avoid the trackpad in circumstances where other mice would be relegated to your bag. The laser-equipped SlimBlade Presenter Mouse ($50) is even slimmer—and slightly shorter and narrower—than the TrackBall Mouse, although with a similar overall design. 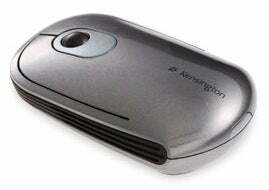 However, it differs from the TrackBall Mouse in two significant ways. The first is that instead of Bluetooth, it uses a radio-frequency (RF) connection via the included USB dongle. Although the dongle isn’t nearly as tiny as the one used by Logitech’s VX Nano, it’s fairly compact and fits inside the Presenter Mouse’s body for travel; a silver piece of trim around the mouse slides forward to reveal a storage compartment. The other difference is that the Presenter Mouse retains a traditional scroll wheel. But that doesn’t mean the mouse is a one-trick pony. Like its sibling, the Presenter has an alter ego—in this case, as a presentation remote. Just hold down the Mode button for two seconds and you’ll see a brief flash from behind each mouse button, indicating that those buttons now function as Back and Forward buttons for Keynote and PowerPoint presentations. The scroll wheel lets you scroll quickly through slides, and the scroll-wheel button pauses the slideshow and displays a black screen. Holding the Presenter in my hand like a remote, pressing the buttons with my thumb, was comfortable for me, although those with small hands may find the Presenter to be on the large side when used this way. I really liked the mouse’s presentation features, which let you leave your Apple Remote at home, but I wasn’t a fan of the mouse as a mouse. Although its super-slim profile makes it great for slipping into the pocket of a laptop bag, the Presenter was a bit too slim for comfortable extended use. And while its laser tracks well, I found the scroll wheel to be difficult to turn easily. 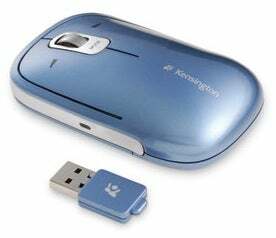 As with the Trackball Mouse, Kensington claims up to six months of battery life from two AAA batteries (included); an LED display on the side of the mouse displays the remaining battery life whenever you insert or remove the RF dongle. I recommend the Presenter Mouse to those who frequently give presentations and occasionally want to use a mouse instead of their laptop's trackpad. But if you do a lot of mobile mousing, and especially if, like me, you have larger hands, it's probably worth the extra bag-bulk to go with a better mouse and a dedicated remote.